In Fort Lauderdale's sought-after Coral Ridge community, this architect-designed Mediterranean-inspired estate fronts a wide, deep-draft canal, just one property from the point, expanding the view to the Intracoastal Waterway from 129+/- feet of shoreline with substantial dockage for a 109+/- foot luxury yacht. Custom built in 2009 and recently updated, the five-bedroom residence makes a striking impression from the sweeping marble drive on tropically landscaped grounds.Traditional design takes on an understated modern tone inside the comfortably elegant living areas, grounded by floors of Jerusalem stone and Brazilian cherry in a layout perfectly planned for the site. Abundant bay windows give a pleasing sense of space, plentiful natural light, and beautiful views from every angle. Flowing off the double-height living room, the club room and gallery are each served by a walk-in wet bar, the ideal accoutrement for entertaining. Several first-floor rooms open their doors to the luxurious outdoor living space, served by a summer kitchen/bar, where the view overlooks the sparkling pool to the wide canal and Intracoastal Waterway. Upstairs, the voluminous master suite opens to a balcony looking out over the Intracoastal and skyline. The view is even more dramatic from the sky deck of the third-floor office/gym that completes this immaculate Coral Ridge waterfront residence.LocationNortheast 26th Place, Fort Lauderdale, Florida. On the Intracoastal Waterway's western shore, minutes from the beach, the gracious Coral Ridge community is home to a prestigious private yacht club and country club.PropertyWaterfront views open to the Intracoastal from this Mediterranean-inspired estate, just one home from the point, on 129+/- feet of shoreline with a new seawall. The full-service dock can accommodate a 109+/- foot yacht and has a 20,000+/- pound boat lift. On the fenced and gated waterside grounds, the resort-like outdoor entertainment space features a free-form saltwater pool with rock waterfall spa, and is served by a summer kitchen/bar and cabana bath. Elegant tropical foliage and night lighting add to the beautiful effect.ResidenceFine finishes give a refined flair in this luxurious residence with five bedrooms, five full and two half baths, laundry rooms on both levels, and three garage bays, one fitted with a lift. Control smart-house automation makes the lighting, media, climate, and security systems function with effortless ease. All windows and exterior doors have impact-rated glass. High ceilings carry through both levels.First Floor: Mahogany and glass doors enter the two-story foyer, set off by a sweeping hardwood staircase, finished with tumbled Jerusalem stone floors that continue through most of the main level. Waterfront views open through the double-height window-lined living room dramatized by a pecky cypress coffered ceiling and a glass-mosaic-tiled accent wall above the slate-encased gas fireplace. Flowing to the pool terrace, the adjoining club/game room is handsomely finished with a Brazilian cherry floor, coffered ceiling, and pub bar with granite counter. 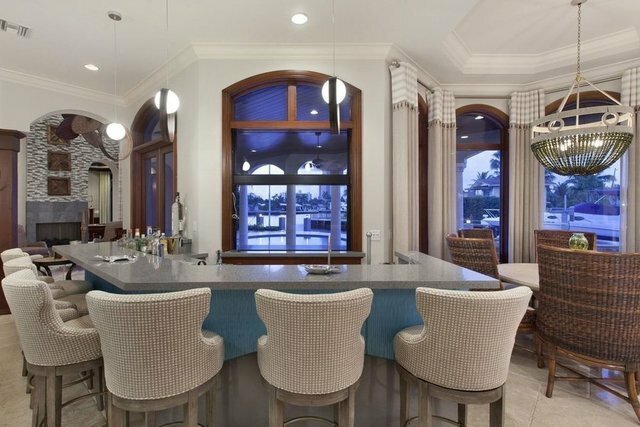 Across the living room, the gallery opens to the waterfront terrace and provides a well-placed professional-style wet bar that also serves the elegant dining room facing the front garden. The powder room is adjacent. Below a tray ceiling with intricate tin tiles, the showpiece kitchen offers maple cabinetry, granite and butcher-block counters, and high-end Thermador appliances including a gas range, double ovens, microwave, warming drawer, refrigerator, and dual dishwashers. French doors flow to the pool terrace from the open family/breakfast room, next to the gallery's wet bar. Off the foyer is a guest bedroom/office with en-suite bath.Second Floor: Opening to a large balcony with waterway vista, the master suite has warm Brazilian cherry floors and is generously sized to include a sitting area. Two walk-in closets flank the suite's luxe marble bath featuring a jetted tub, multi-head shower, and two separate water closets. Three more bedrooms with walk-in closets and private baths include another spacious suite that opens to the waterfront balcony. Spiral stairs lead to the third-floor office/gym with wet bar and sky deck.